Previously the RTT was using the FreeRTOS critical section calls if FreeRTOS was used. 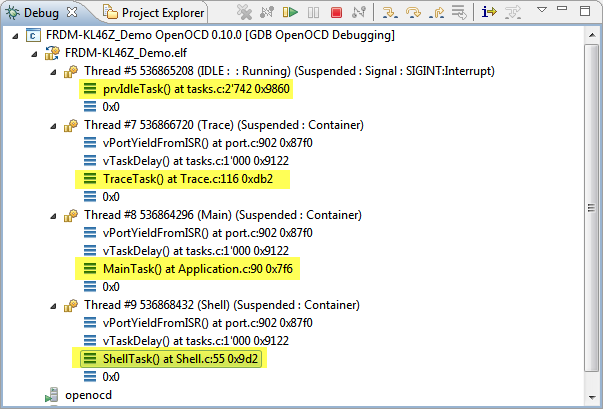 This could cause issues if Segger RTT calls were used from an interrupt context. Now it is using its own critical section handling and masks interrupts up configMAX_SYSCALL_INTERRUPT_PRIORITY. 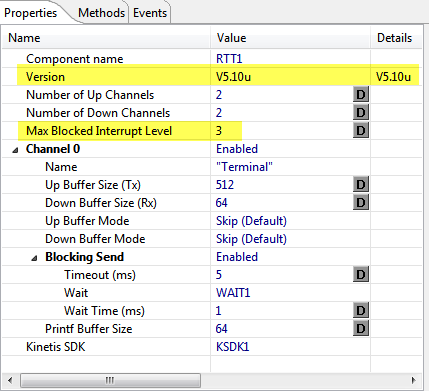 If FreeRTOS is used, then the Segger RTT ‘max blocked interrupt level’ setting is ignored and the RTOS blocked interrupt level is used instead. 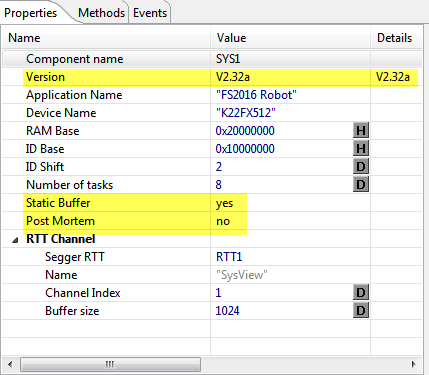 The SystemViewer has been updated to v2.32a which includes static buffer and post mortem tracing (see https://www.segger.com/systemview.html). With Post Mortem it is possible to attach to a crashed system and find out what it was doing as last thing. With static buffers the amount of stack space needed is reduced, and it is using a global memory buffer instead. This deserves its own article, so hopefully I can post the tutorial on that one soon. 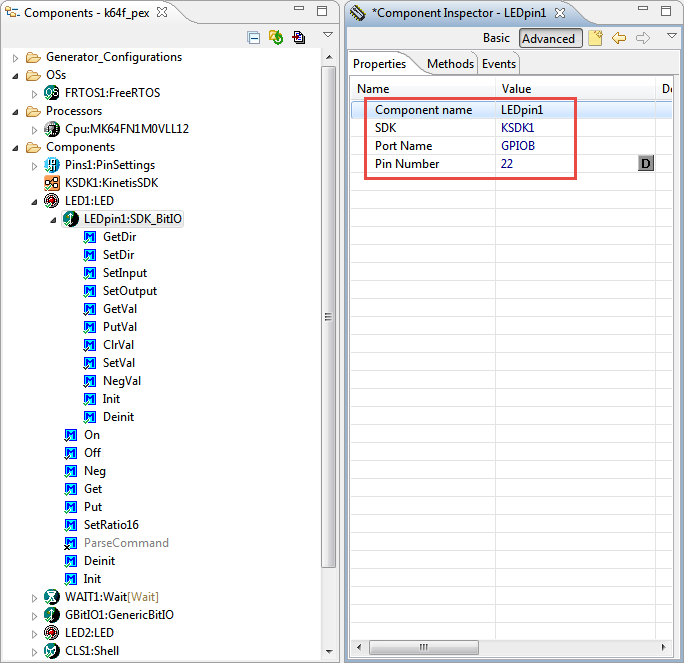 As the NXP Kinetis SDK does not include any Processor Expert support, I was looking into ways how to continue to use the McuOnEclipse components with the Kinetis SDK v2.x. With using newer components, you might be asked to add the Kinetis SDK component to your project and specify that in the component settings. That change is backwards compatible, so you can open ‘newer’ projects with ‘older’ versions of the components. But using the new components might mean that you need to update your project component settings. The functionality is still ‘experimental’, so I will continue to work on that support. And this feature alone probably deserves an article on its own :-). This release comes with a set of bug fixes and new features, and can be installed over an existing component installation. With the added support for the Kinetis SDK v2.0 existing projects needs to update the settings which should be be very easy. 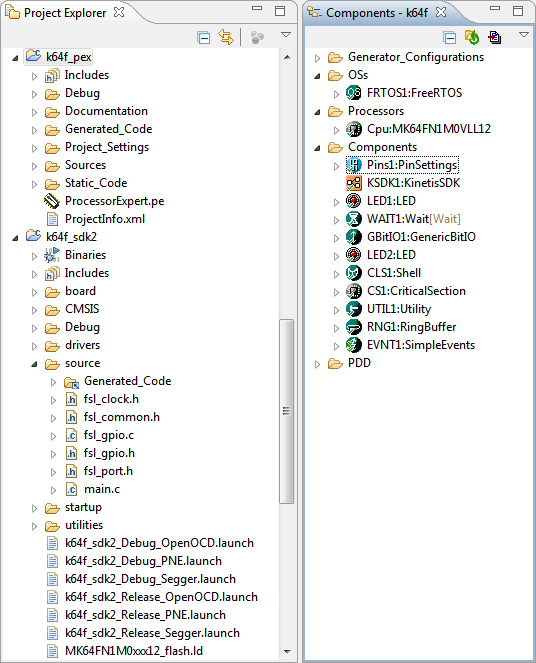 I plan to write follow-up articles about the FreeRTOS thread debugging in Eclipse plus how to use the new concept and components with the Kinetis SDK v2.0. This entry was posted in Component Release, CPU's, Debugging, Eclipse, Embedded, Embedded Components, FreeRTOS, Freescale, NXP, Processor Expert, SDK, SourceForge, USB and tagged arm gcc, CodeWarrior, Eclipse, Embedded Component, FreeRTOS, Freescale, gnu gcc, NXP, open source projects, Processor Expert, Segger, software project, technology by Erich Styger. Bookmark the permalink. if I create a new project by KDS3.2 with sdk2.0, I can’t use PE, is this right? yes, that’s correct: you cannot create a project with the SDK v2.0 wizard with Processor Expert enabled. There is no Cpu component for the KL27Z. What I’m showing in this post basically is to have two projects: one with Processor Expert (for a dummy Kinetis device which is supported), and a normal SDK v2.0 project. I’m using then the generated code from the Processor Expert project in the SDK project. Of course I don’t have all the hardware components (low level drivers), but that’s not a big problem as they are covered by the SDK files. I would appreciate a tutorial on the thread aware debugging in Eclipse when you get to it. In the meantime do you have any reference links I could read relating to what you’ve achieved. Hi, I’ve spent enough time trying to create a square wave pulse and variable and achieved but I need the variable that is controlled by the pulse also has a counter. How can I do this? I’m not really clear what kind of square wave you want to generate? Using the Kinetis FlexTimer you should be able to do pretty much anything? Thank you for answering now I have solved the problem of the generation of pulses with variable frequency. With regard to serious matrix keyboard much help it could finish, also thanks for answering your page me has been very helpful. After update this components-packages, at compile/builder time, every of this components (LED and WAIT) mark an error, because the builder/compiler dont found any SDK. 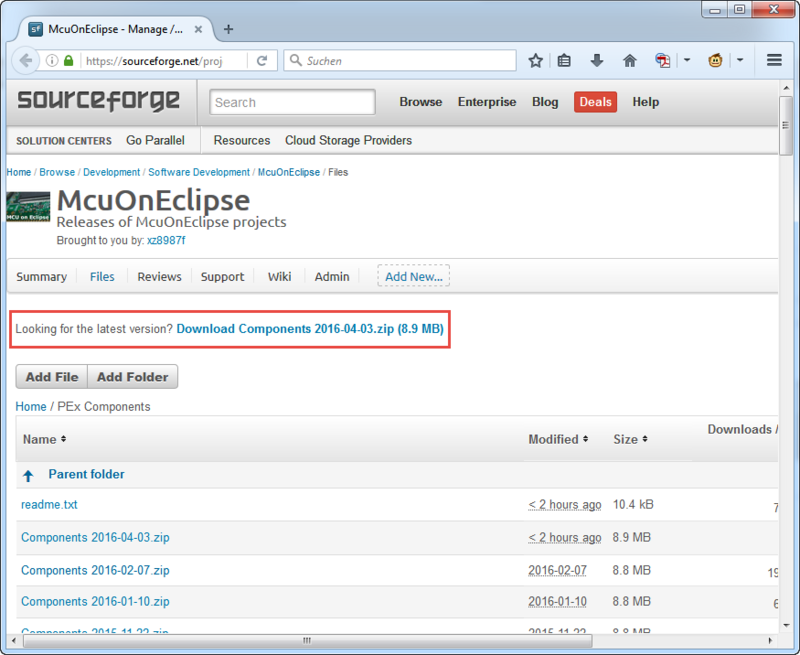 see https://mcuoneclipse.com/2016/04/03/mcuoneclipse-components-3-apr-2016-release/ and Kinetis SDK v2 support: I had to add the KinetisSDK component to many components to make them working with the Kinetis SDK. If you are not using the SDK, it still needs that component (to know that you are not using the SDK), simply have the SDK selection to ‘none’. 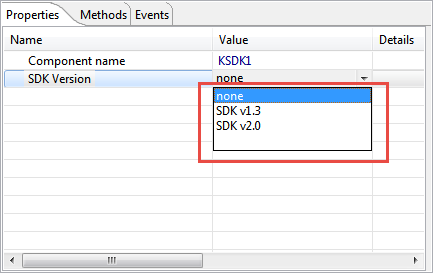 Into the form of “components inspector”, at value-field of SDK (below Component Name), the system suggest only “New component[KinetisSDK]…” but not the option “none” and for default it prompt the option KSDK1. The unique solution is to reload the previous release of components-package, since 2016-02-07. May be an errata configuration on my CW? 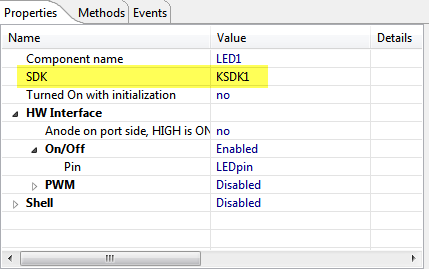 how can I use FSL_USB_Stack with kl27z FOR HID class? no, this is not supported. Because the KL27Z is not supported with Processor Expert (without the SDK). Hello I think I’ve found something of a bug…. Updating CriticalSection (CS1) to 1.008 seems to cause the SDHC sub-component of my FAT_FileSystem/FatFsMemSDHC break. it somehow decides that sdhc1_SetWriteProtecton is ill-defined?? I don’t really understand /how/ such a change can effect things but ???? thanks for reporting and for filing the issue on GitHub as well (https://github.com/ErichStyger/mcuoneclipse/issues/31). I plan to release a new version on the week-end. If you need it earlier, please let me know. yes, it is a bug (https://github.com/ErichStyger/mcuoneclipse/issues/31) caused by a wrong macro. I’ll have to release a new version of the components as soon as I can.